riders to compete at a national level. 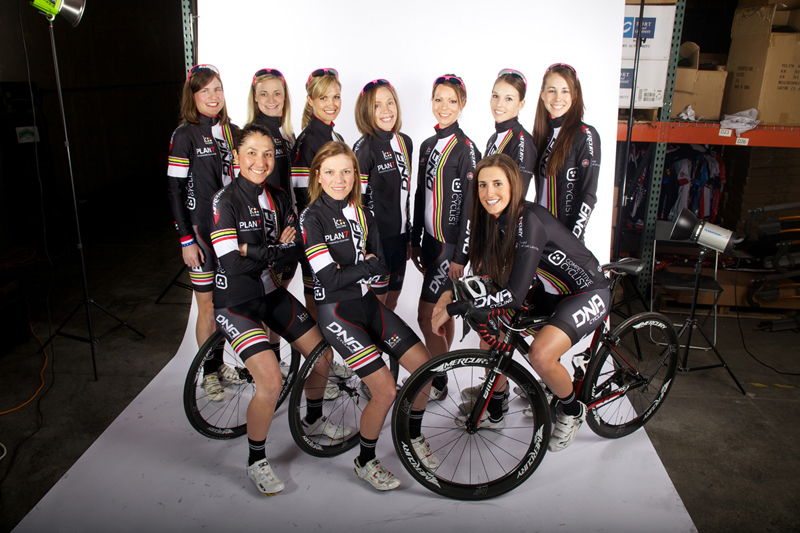 Salt Lake City, UT – Utah has a new powerhouse women’s road racing team. DNA Cycling powered by Plan7, recently announced its 2013 roster. Headquartered in Utah, the team’s riders boast accomplishments ranging from international professional experience to national and local championship titles. The first year squad is comprised of 13 members, primarily residents of Utah with riders also based in California and Idaho. For 2013, DNA Cycling powered by Plan7 will be led by international veteran rider Flavia Oliveira, who plans to race part of the season in Europe for the Brazilian National Team. Oliveira has as her biggest goal the 2016 Olympics in her hometown, Rio de Janeiro. Other members of the nascent squad with notable palmarès are Anne Perry, National Masters 35+ Road Race Champion; Utah State Double Champion (Road Race and Time Trial), Megan Jensen Hill, who is coming back from a serious injury sustained in a crash last year; and collegiate racer Mikayla Lyman, reigning Idaho State Road Race Champion. The team is proud to be supported by companies that share the mission to promote women’s cycling: DNA Cycling, Plan 7 Endurance Coaching, Mercury Cycling, Competitive Cyclist, Wasatch Bike Support, Rudy Project, Skratch Labs, Coffee Collective, Cotton Sox Photography, West Valley Auto Plaza, Excelerator Sports LLC, Fiat of Salt Lake City, Miller Guymon PC, Cannon Disability Law, and Gear Rush. To learn more about the program, its racers, coaches and sponsors, visit: http://www.dna-plan7.com.